Type studies of corticioid Hymenomycetes (Basidiomycota) with aculei. Nakasone, K. K. (2009) Type studies of corticioid Hymenomycetes (Basidiomycota) with aculei. 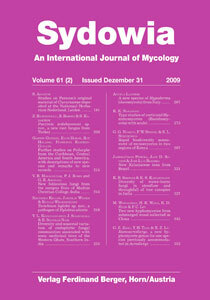 Type specimens of ten, resupinate, corticioid basidiomycetes with aculei described by various authors were examined. Five species are later synonyms: Acia conferta P.H.B. Talbot (= Phanerochaete subquercina), Hydnum squalinum Fr. : Fr. (= Cerrena unicolor), Melzerodontia udamentiens P. Roberts (= Phlebia badia), Mycoleptodon ljubarskii Pilát (= Hydnophlebia chrysorhiza), Odontia griseo-olivacea Höhn. (= Phlebia uda). The new combination, Scopulodontia webbii (º Hydnum webbii Berk. ), is proposed. Phaeoradulum guadelupense Pat. is a species of unknown affinities. Three species were tentatively identified to species: Hydnum bresadolae Quél. (= Dentipellis cf. fragilis), Hydnum stalagmodes Berk. & M.A. Curtis (= Phlebia cf. fuscoatra), and Odontia palumbina Höhn. (= Scopuloides cf. rimosa). The misapplication of the name Hydnum squalina is discussed. Keywords: Hydnum limonicolor, Odontia latemarginata, Odonticium monfraguense, Odonticium flavicans.